Ensuring that art placed in the garden and not seemed forced is an art in itself. 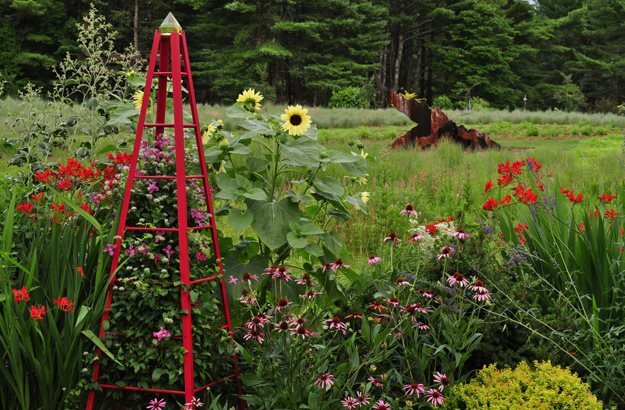 Owners of Bedrock Gardens in Lee, New Hampshire share 5 things to consider when adding art to the garden, where their motto is; pretty’s not enough – make it work for you. As her garden of 27 years matured, sculptor Jill Nooney gave it an appraising look and decided that in its approaching middle age it could use some good jewelry. 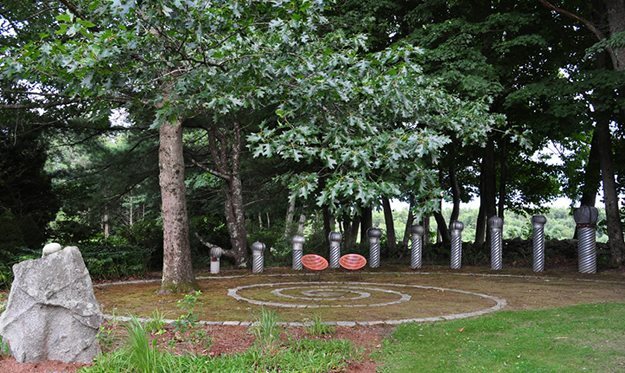 Spread across 20 acres of a former dairy farm in Lee, New Hampshire, Bedrock Gardens, the creation of Jill and her husband, Bob Munger, needed more than plants to create the experience of a fanciful journey. 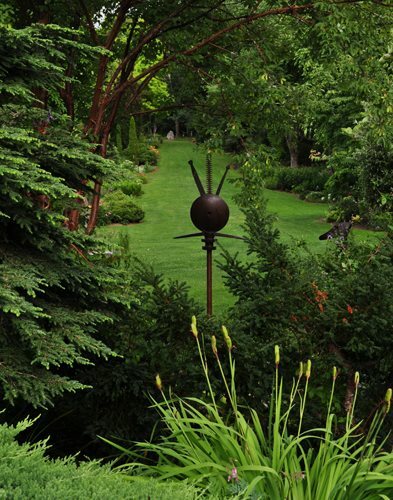 A sculpture in the distance draws the eye all the way through this section of the garden. (Photo by: Pam Penick). “Art can do something that plants alone cannot,” she says. “It creates a there there.” Jill uses sculpture to lead visitors along and devise moments of surprise and delight on the way. Dissatisfied with traditional garden-art offerings, Jill began making her own sculptural pieces. She didn’t exactly adorn her garden with middle age-appropriate pearl chokers or diamond studs either, choosing instead to create colorful, bold, tongue-in-cheek pieces. Repurposing found objects and old farm equipment, Jill’s art features contemporary abstract sculptures as well as humorous human figures, supersized bugs, and garden arches and tuteurs. A red tuteur stands tall amongst a compilation of perennials. (Photo by: Pam Penick). Little did she know just how attractive her "there" would prove to be. Today, where dairy cows once grazed, Jill and Bob’s playful, art-filled garden attracts thousands of visitors (2,500 in 2013) at open houses held every third weekend from May through October. 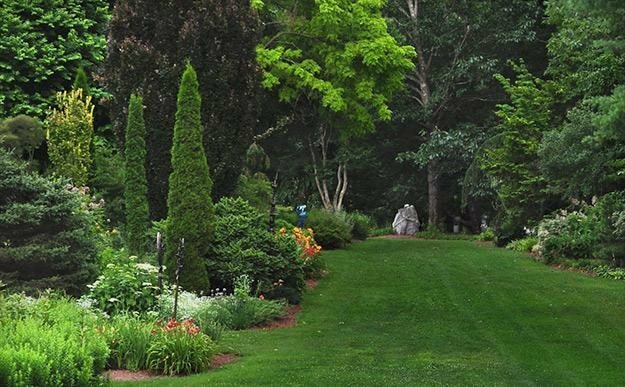 Aside from the pleasure of sharing their garden with the public, the couple hopes the open houses will raise awareness for their Friends of Bedrock Gardens, a tax-exempt charity whose mission is to eventually convert Bedrock into a public garden. Until then, Jill and Bob continue expanding and refining their garden in a harmonious partnership. Dubbing herself the “problem maker,” Jill is a wellspring of ideas, which Bob, the “problem solver,” enjoys bringing to fruition. Jill spends the long winters making new sculptures, which she thoughtfully places in the garden to enhance the journey.Looking at how Jill uses sculpture in her garden can give any gardener fresh ideas for placing art. Here are five things to consider when incorporating art in the garden. 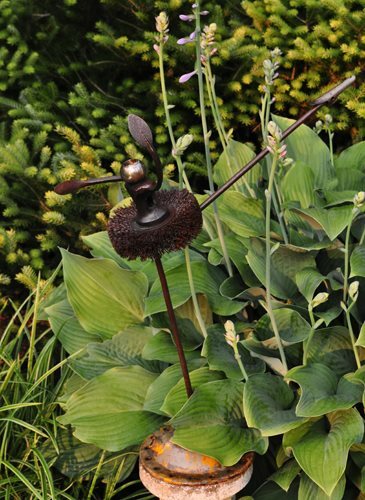 Looking at how Jill uses sculpture in her garden can give any gardener fresh ideas for placing art. Here are five things to consider when incorporating art in the garden. Attract the eye and the feet will follow. 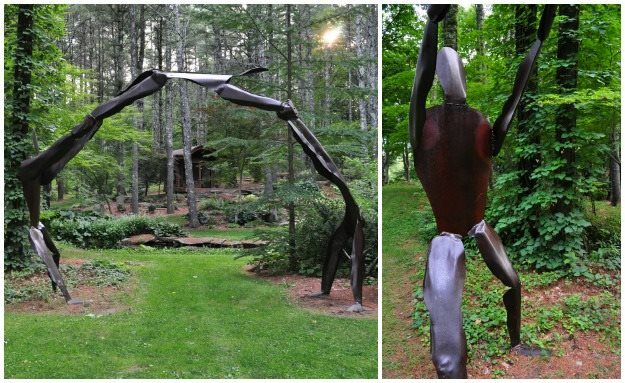 Jill places sculptures at each end of long axis views, or sight lines, to pull visitors through her expansive garden. Like magnets, these focal points, framed by flowing borders and garden arches, irresistibly draw visitors toward them and create a destination when they get there. Looking back, another sculpture is similarly framed at the opposite end, completing the double axis view. This acrobat arch frames a view of the teahouse garden beyond and invites visitors to explore further. (Photo by: Pam Penick). While often seen in formal gardens, axis views are effective in naturalistic, meandering gardens too. Jill emphasizes long views with sculptural arches that frame focal points in the distance, like the teahouse pictured above partially hidden on a wooded slope. In the foreground, an oversized metal arch of three acrobats frames the view and playfully invites visitors to enter the teahouse garden. The perfect placement of two red sculptures, along with red blooming plants creates a visual rhythm that is pleasing to the eye. (Photo by: Pam Penick). In any garden journey, rhythm draws you along, like a beat you can’t help tapping your toes to. 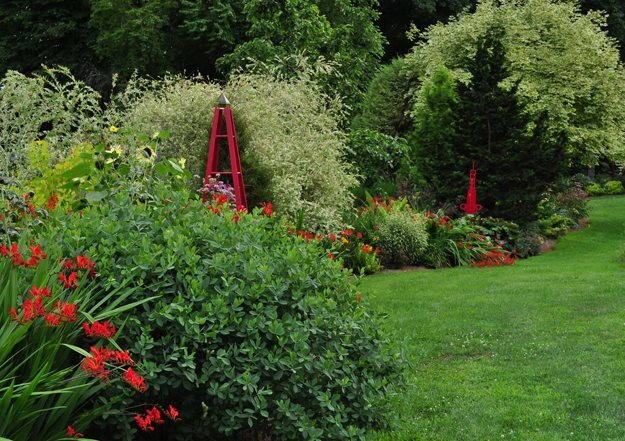 Jill expertly repeats bold reds in this long, undulating border of perennials, shrubs, and trees. Skipping along the border’s edge, fire-engine-red Crocosmia blazes in summer, accompanied by a red-painted tuteur and, farther along, a contemporary sculpture. In counterpoint, variegated plants like Salix integra ‘Hakuro-nishiki’ (dappled willow) and Acer platanoides ‘Drummondii’ (harlequin maple) skip to the beat as well. Here, the purple globe echoes the shape and color of the alliums. (Photo by: Pam Penick). For aha moments along the way, Jill merrily echoes flower color with her art. 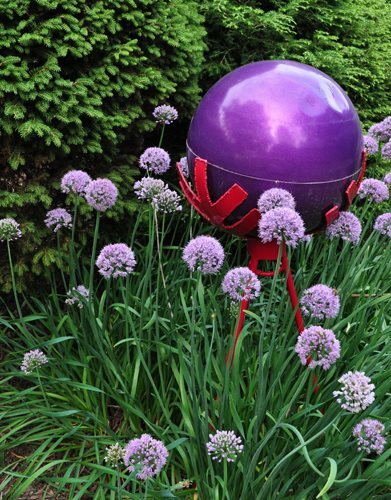 Here the spherical, lavender flower heads of allium are repeated and concentrated in a purple globe cradled by her powder-coated steel “Feathers and Arrows” base. Old bulldozer and wagon rims were used to create this sculpture. (Photo by: Pam Penick). Rusty, discarded farm tools piled in the barn are Jill’s treasure trove for making sculpture. With a talent for seeing new shapes in discarded metal, she reassembles these found objects into sculptural pieces full of life and humor. There’s a synergy, she says, in repurposing tools that once worked the land into art to adorn it. 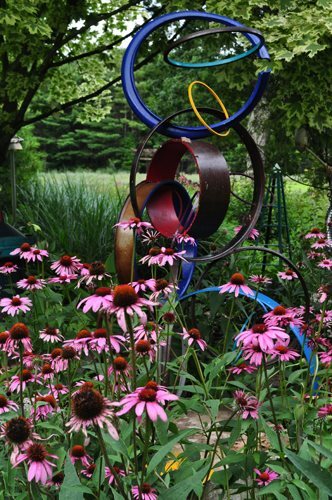 “Ring Toss,” pictured above, brings contemporary color and energy to Jill’s garden even as its parts—old bulldozer and wagon rims and steel pipe—hark back to the land’s agricultural past. An old tap for collecting maple syrup was incorporated into this piece. (Photo by: Pam Penick). Twirling above the rippled leaves of a ‘Krossa Regal’ hosta, this tiny dancer’s pointy toe is an old tap once used to collect syrup from the maple trees that forest the New Hampshire landscape. Culvert pipes and roof vents create an unexpected installation at the edge of this clearing. (Photo by: Pam Penick). Unexpected materials or collections of items can be massed creatively to surprise visitors and delight them with the novelty of seeing everyday objects in a new light. Jill had amassed a collection of roof vents and culvert pipes, which, in a flash of inspiration, she turned into her “Swirl Sculpture.” The Fibonacci-based spiral paving adds a contemplative element to the whimsical scene. These characters, assembled from scrap metal, are just plain fun. (Photo by: Pam Penick). 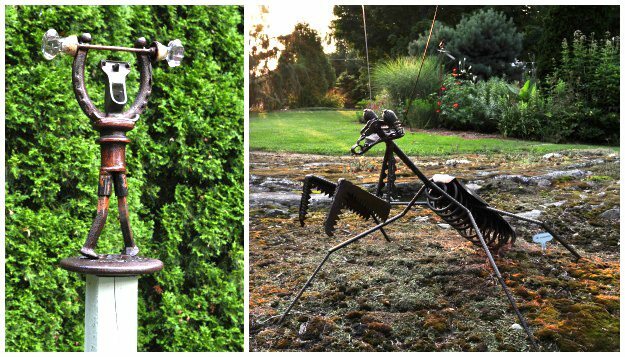 Jill populates her garden with chuckle-inducing, sometimes menacing, characters that she dreams up out of scrap metal. Eliciting an emotional response from visitors is key to creating a memorable garden, plus it’s just plain fun. So take a chance and place something unexpected in a hidden nook along a garden path, or mass a collection of ordinary objects to increase their significance. Keep in mind that the power of any piece of art is enhanced when it isn’t forced to compete with other focal points. Let one sculpture or collection be the star in any garden space, and place other pieces farther along sight lines where you want visitors to walk, as well as in tucked-away spaces that will delight upon discovery. This way, your art isn’t just a pretty face but is working hard to make your garden a journey of discovery.